As many as four in every 100 women enter menopause at a young age. Many of them are shocked because they expect to go through it in their fifties, the age at which most women experience menopause. Filled with uncertainty, they start looking for the causes that might be behind this early transition. Learn more about the different causes of early menopause or premature menopause, ranging from hormone fluctuations and stress to hysterectomy. Like in menopause that happens later in life, hormonal fluctuations are one of the root causes of early menopause. However, it is not fully known why these hormonal fluctuations are triggered earlier for some women. There are, however, certain conditions that can cause hormonal imbalance, ultimately leading to early menopause. Early menopause is considered a natural occurrence when it is due to premature ovarian failure (POF), a condition that affects hormone levels. Also known as primary ovary insufficiency, it is the dysfunction or loss of eggs at a young age. It can occur at any age before 40, even in women's teens. Premature ovarian insufficiency is also related to chromosomal or genetic conditions such as Tuner syndrome, Swyer syndrome, and androgen insensitivity syndrome (AIS). Enzyme defects. Galactosemia and thalassemia, two rare genetic diseases, can impact the functioning of the ovaries. Other causes. Abnormal gonadotropin (FSH and LH) secretion and autoimmune diseases may also be connected to POF. Early menopause as a consequence of medical interventions is referred to as induced menopause. Tubal ligation. This procedure affects ovarian hormone production, possibly leading to some menopause-like symptoms. Hysterectomy. In this procedure, the uterus, Fallopian tubes, or ovaries are removed, causing hormone production to decrease dramatically. Chemotherapy or radiation therapy. Women over 35 have a higher risk of entering early menopause when exposed to chemotherapy. These factors may contribute to a decrease in hormone levels or worsen early menopause symptoms. Stress. Another cause of early menopause in women. Recent studies have shown that women tend to begin menopause at an earlier age when they have heightened stress levels. Smoking. Women who smoke have a higher rate of early menopause. It has been shown that smoking and alcohol intake triggers hormonal imbalances in the body, potentially leading to early menopause over an extended period. 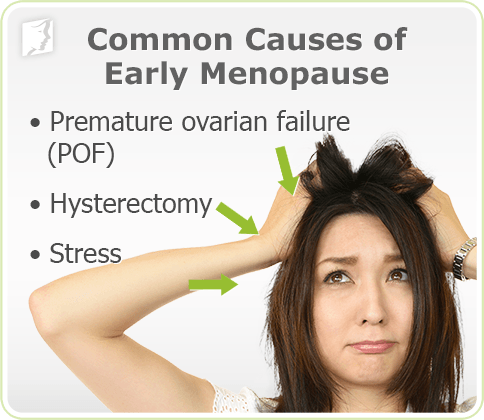 Early menopause can happen for various reasons at any age. Therefore, identifying the causes of early menopause is essential in order to manage symptoms. For more information regarding this topic, go to the section about early menopause signs and symptoms.